The day you discover your purpose, you will not work another day in your life. These were the words of Mr Linda Ntuli – an inspirational speaker of note, a sales consultant, life coach, facilitator, and a team-builder, who addressed staff and students at the University of Johannesburg’s (UJ) Soweto Campus on Thursday, 12 February 2015. 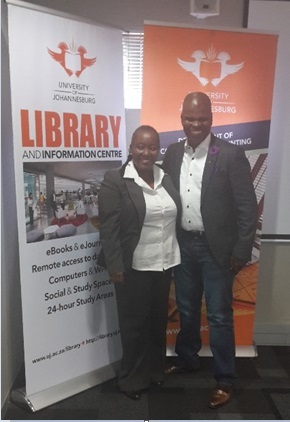 The motivational speaker inspired the UJ community at his talk From Nothing To Something, Personal Excellence, organized by the UJ Library in collaboration with UJ’s Department of Commercial Accounting. Mr Ntuli spoke about the three types of people that exist in the world. The undertakers, the care takers and the over takers (risk takers). “Work hard! When your time has come, there is nothing that can stand in your way,” Ntuli said. Encouraging and warning against comparisons and passiveness, the Sowetan born and raised said that one should become a driver in life and not a passenger. “Passengers agree with whatever situation is thrown at them. Drivers stand out and do not settle themselves to fitting in crowds, because they are worth much more,” said Ntuli.